The device that makes opening and closing your garage door an automatic process is called the opener. This is an electro-mechanical unit that operates similarly to a car's engine. It uses a motor to produce the horsepower output required to power the movement of your door. 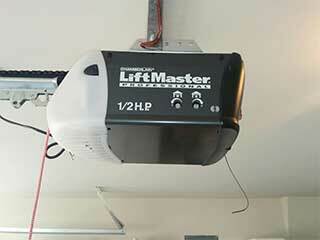 There are three main types of garage door openers that are commonly used today. Each of these types offers different benefits and brings with it a few disadvantages as well. Our experts can help you decide which type, and which model, is going to be the one that's best suited for your specific needs. Openers of this type use, as their name suggests, a chain, which makes them the loudest of the three options, as well as the one that requires the highest amount of regular maintenance. However, models of this type are usually very strong, as well as relatively cheaper than the other options. Belt-drive openers operate in a similar way to the chain-drive type, the main difference being that they use a steel-reinforced rubber belt, much like a conveyer belt. Units of this type are usually preferred for their smooth and silent operation. Their main downside is that they tend to be on the more expensive side. If you have a garage that's near a bedroom, you may want to get one of these. Last, but certainly not least, there is the screw-drive option. Openers of this type are usually favored for their very low maintenance requirements. They consist of very few moving parts, and are relatively strong as well, which can make them a good choice, depending on the weight and style of your door. We can do more than help you choose the perfect opener for you. We can also repair these units when something goes wrong. Whether it's a matter of replacing a worn-out motor gear or installing a new circuit board because the old one got fried in a power outage, you can always count on our team to get things done quickly and efficiently. Our experts at Garage Door Repair Baytown can help if you're looking to have a new opener installed or if you need any type of professional assistance. Call us today.